Made from solid mahogany wood which is only sourced from sustainable plantations. A beautiful reproduction antique bed, slightly used. does not detract from the look of the bed. This bed has been used in a spare room occasionally. All our products are made from Grade A or B Solid Mahogany or Teak wood. Finish colour : Antique Mahogany. Here are your options In addition to our products, we also specialize in custom-building furniture to fit your exact specifications. All our products are made from Grade A or B Solid Mahogany or Teak wood. We are able to reproduce any discontinued products, hard to find products, or those that are no longer available elsewhere. Finish colour :Our Trademark Shadow colour. Chesterfield style upholtery. Solid High QualityMatt Black finish colour. Finish colour : Matt Black ( ask for other colors ). We are able to reproduce any discontinued products, hard to find products, or those that are no longer available elsewhere. French Brodsworth Sleigh Bed Gloss Finish,Handcrafted from solid mahogany WOOD. 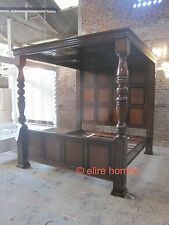 Reproduction Queen Anne style four poster bed with canopy, FREE UK MAINLAND DEL. All our products are made from Grade A or B Solid Mahogany or Teak wood. We are able to reproduce any discontinued products, hard to find products, or those that are no longer available elsewhere. Finish colour : Any colour. Finish colour : Matt Black. We are able to reproduce any discontinued products, hard to find products, or those that are no longer available elsewhere. All our products are made from Grade A or B Solid Mahogany or Teak wood. Finish colour : Any Colour. Interiors are a beautiful world. A world We couldn't live without. Here are your options We are able to reproduce any discontinued products, hard to find products, or those that are no longer available elsewhere. 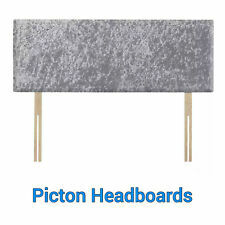 It features a rattan headboard and fine hand carved detail. Handcrafted from solid teak which is only sourced from sustainable plantations. This stunning Bed with a tall headboard, is made from excellent quality solid mahogany wood which is only sourced from sustainable plantations. We are able to reproduce any discontinued products, hard to find products, or those that are no longer available elsewhere. Finish colour : Any colour. Here are your options All our products are made from Grade A or B Solid Mahogany or Teak wood. We are able to reproduce any discontinued products, hard to find products, or those that are no longer available elsewhere. All our products are made from Grade A or B Solid Mahogany or Teak wood. In addition to our products, we also specialize in custom-building furniture to fit your exact specifications. We specialize in custom-build furniture. In addition to our products, we also specialize in custom-building furniture to fit your exact specifications. We have the largest selections of handcrafted furniture in the world. 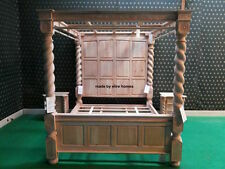 The bed has intricate hand carved detail on the headboard and foot board as well as the half tester canopy. 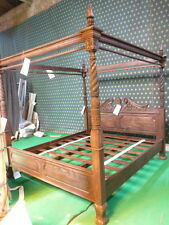 Antique reproduction Half Tester Bed. Handcrafted from solid mahogany wood which is only sourced from sustainable plantations. All our products are made from Grade A or B Solid Mahogany or Teak wood. Finish colour : Dark Mahogany. We are able to reproduce any discontinued products, hard to find products, or those that are no longer available elsewhere. Finish colour : Hot Pink. We specialize in custom-build furniture. In addition to our products, we also specialize in custom-building furniture to fit your exact specifications. We have the largest selections of handcrafted furniture in the world. All our products are made from Grade A or B Solid Mahogany or Teak wood. Finish colour : Silver. In addition to our products, we also specialize in custom-building furniture to fit your exact specifications. French Carved Rattan Bed with High Headboard IN Wax OR Antique Gold,free del uk. We are able to reproduce any discontinued products, hard to find products, or those that are no longer available elsewhere. Finish colour : BLACK. All our products are made from Grade A or B Solid Mahogany or Teak wood. All our products are made from Grade A or B Solid Mahogany or Teak wood. We are able to reproduce any discontinued products, hard to find products, or those that are no longer available elsewhere. Finish colour : Solid Diamond White. The bed is hand crafted with intricate carved detail particularly on the tall pillars. A beautiful reproduction antique bed with lovely carved detail. Carved Chrub design. 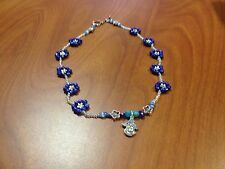 Popular colour options are - antique white & real gold leaf. All our products are made from Grade A or B Solid Mahogany or Teak wood. We are able to reproduce any discontinued products, hard to find products, or those that are no longer available elsewhere. Finish colour : White. Made from solid mahogany wood which is only sourced from sustainable plantations. 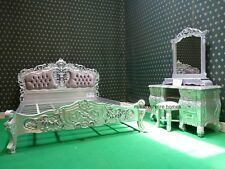 A beautiful reproduction antique bed. 6' super king - H220 x W204 x D225 cm. 5' king size - H220 x W174 x D225 cm. Traditional antique wax finish (other finishes available inc gold leaf). All our products are made from Grade A or B Solid Mahogany or Teak wood. Finish colour : Silver Leaf. We are able to reproduce any discontinued products, hard to find products, or those that are no longer available elsewhere. Handcrafted from solid mahogany wood which is only sourced from sustainable plantations. Intricate hand carved detail on the headboard and footboard. A beautiful reproduction antique bed. 6' super king - H219 x W200 x D224 cm. All our products are made from Grade A or B Solid Mahogany or Teak wood. Finish colour : Angtique White. Here are your options We are able to reproduce any discontinued products, hard to find products, or those that are no longer available elsewhere. We are able to reproduce any discontinued products, hard to find products, or those that are no longer available elsewhere. Finish colour : Any colour. All our products are made from Grade A or B Solid Mahogany or Teak wood. A beautiful reproduction antique bed with lovely carved detail. 6' super king - H180 x W202 x D225 cm Straight forward assembly. 5' king size - H180 x W172 x D225 cm. PHOTO SHOWS A KING SIZE. Traditional antique wax finish. We also have matching NIGHTSTANDS DRESSING TABLE STOOL AND MIRROR and CHEST OF DRAWERS for this bed which we can list with buy it now. Finish colour :Solid Diamond White ( ask for other colors ). All our products are made from Grade A or B Solid Mahogany or Teak wood. Solid mahogany Shell Sleigh Bed. The headboard and footboard feature intricate hand carved detail. 20% Deposit required. Foot board height: 97 cm in the centre. 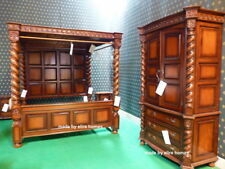 Other matching bedroom furniture available such as Wardrobes, Chest of Drawers, Dressing Table, Bedsides etc.